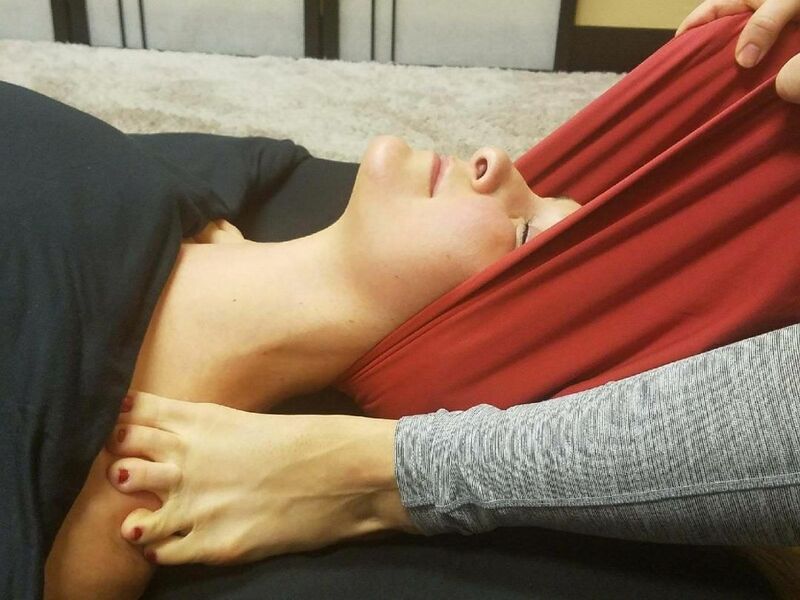 Aerial Ashi is amongst the deepest tissue work in the massage world, yet it's very easy to receive. Unlike pointy thumbs and elbows, this modality is not painful. Because the broad surface of the foot is used instead, it's very comfortable for you to deeply relax into the strokes. Deep compression and gliding effleurage strokes are applied with lotion in this barefoot technique. The ribbons overhead allow for control, pressure and balance, and provide a safe, effective, therapeutic massage. Benefits Include: elongating the spine, stretching muscles, breaking down scar tissue to increase range of motion and flexibility, greatly increased circulation, easing pain and tension, enhancing body's self-healing abilities, increased lymph flow, improved posture, strengthens the immune system, and induces deep relaxation, reducing stress. This is a full body therapy applied to both the front and back of the body; the top of the neck to the soles of the feet. Hands are also used for areas that require more specific attention, such as the scalp and face, and will accommodate individual requests within the scope of practice. This style of massage is easily customized to your needs.